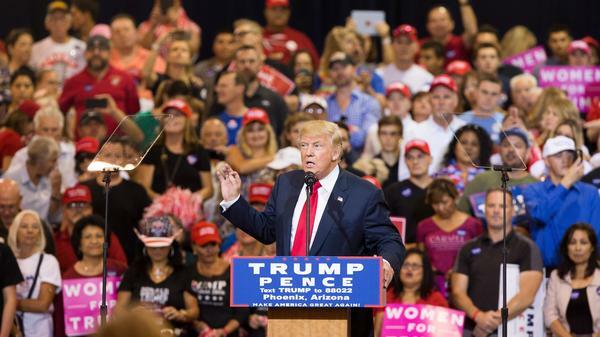 Then-candidate Donald Trump speaks at Phoenix's convention center in October 2016. Phoenix Mayor Greg Stanton says he's "under no illusions" that President Trump will heed a late-hour plea to postpone a campaign rally planned in his city for Tuesday night. "We don't want to cancel the presidential visit overall, but a delay would be the appropriate action by the White House," Stanton said at a news conference Monday afternoon. Stanton, a Democrat, has publicly sparred with Trump over his plans for the rally since Friday, following a tense week of protests over the president's blaming of "both sides" for the violence at a white nationalist rally in Charlottesville, Va., on Aug. 12. Stanton has said the timing is inappropriate as the nation is still healing. Trump is scheduled to speak at the convention center in downtown Phoenix at 7 p.m. MT before traveling to Reno, Nev., on Wednesday. Before arriving in Phoenix, he'll visit a Marine Corps base in Yuma, Ariz., along the U.S.-Mexico border. Tuesday "will be a difficult and trying day for our city and for the law enforcement professionals whose job it is to keep everyone safe," Stanton said. Stanton stood with the city's police and fire chiefs, the Maricopa County attorney and sheriff and other local leaders before TV cameras at the Phoenix Police Department. They sought to reassure an increasingly weary public here that the city is ready. Indeed, a heavy police presence is expected on the streets around the Phoenix Convention Center downtown Tuesday evening, where crowds in the tens of thousands are predicted. Phoenix Police Chief Jeri Williams gave few details about specific security plans, saying only that law enforcement will deploy at "maximum staffing" and that the city and authorities are working closely with the Secret Service and White House. Williams insisted her force will strike an appropriate balance between First Amendment rights and public safety. Authorities are bracing for the possibility of violence, but they've yet to receive any credible threats. "We haven't received any specific intelligence or information to dictate that businesses should close," Williams said. Still, the mood in parts of downtown Phoenix and more broadly across the desert region is tense. Vandalism was reported this week at a Confederate memorial east of the city this week, the second time in as many days. Groups from the far left, like antifa, as well as the far right, including militias and pro-open-carry gun activists, are also expected to have a significant presence outside the convention center. And in the background are news reports that Trump may use the rally to pardon the former Maricopa County sheriff, Joe Arpaio. An immigration hard-liner, he has prompted plans for at least two downtown marches by indigenous rights groups to coincide with the rally. "A pardon of Sheriff Arpaio by President Trump is an official endorsement of racism and white supremacy," said Carlos Garcia, of the Phoenix-based immigrant-rights group Puente. Maricopa County Sheriff Paul Penzone, who unseated Arpaio in the election last fall, said police will do all they can to ensure that protesters can speak freely, but that any threats of violence will be taken seriously. Authorities on Monday warned that anyone who resorted to violence would be prosecuted to the full extent of the law. "Peace is the only option," Penzone said.